"It's never a mistake to care for someone. That's always a good thing." We all know "truth in advertising" is largely a misnomer, but the crew responsible for marketing Radio to the general public could certainly benefit from an ethics refresher course. Everything about the ad campaign for this heartwarming family film�from the theatrical trailer to the DVD cover art to the trite tagline, "His Courage Made Them Champions"�leads us to believe it's all about high school football. Sure, the main character is a mentally handicapped young man who's nurtured by the school coach, becomes the team mascot, and inspires the players. But all that personal drama is wrapped up in the football season and the team's quest for the state crown, right? False impressions, however, lead to dashed expectations, and Radio's second half drags because we're waiting for the big sports payoff that never comes. Watching Radio's progression from an unresponsive, withdrawn individual to an outgoing, enthusiastic cheerleader in all aspects of life is rewarding, but we're unprepared for the film's more languorous pace once the rousing gridiron scenes conclude. And when Radio and the ramifications of Coach Jones' aid become a political and divisive issue within the athletics-obsessed community, the movie adopts a stilted, self-righteous tone. At its core, Radio is little more than a glorified TV movie, but its fine production values, considerable star power, and universal appeal make it worthy of big screen treatment. Yes, it's often emotionally manipulative, but an honest sweetness often shines through, and the filmmakers aren't so stymied by political-correctness that they shy away from showing the lighter side of Radio's unnamed and undiagnosed infirmity. Radio most definitely enriches the lives of those around him, and his benevolent spirit and genuine goodwill quickly win us over without any directorial tricks. Most interesting, however, is the way the small southern town embraces the African-American Radio without any racial bias. After all, the movie takes place in 1976 when desegregation was still a hot button topic nationwide, and though a few members of the football team taunt and haze Radio at the beginning of the film, their animosity seems directed at his mental deficiencies rather than his skin color. At one point, a novice police officer does wrongly arrest Radio on suspicion of theft, but is quickly reprimanded by Coach Jones and his law enforcement superiors. Such enlightened attitudes are admirable, but it's hard to believe the small town of Anderson was really a colorblind shangri-la almost 30 years ago. 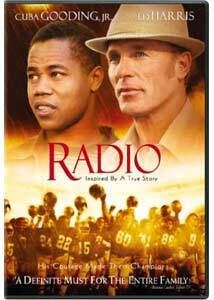 Alfre Woodard as the black school principal counsels Coach Jones with a refreshing candor, and her concern over whether mainstreaming Radio will actually cause him more harm than good provides the film with its most wrenching dilemma. Woodard possesses a sympathetic strength that's tremendously effective, and her scenes of debate with Harris rank among the movie's highlights. Winger, back on screen after a multi-year hiatus, hasn't lost her touch, and although her transition to a rather matronly role is jarring at first, she quickly inhabits her character, shading her portrayal with a quiet empathy that resonates throughout. Gooding and Harris work well together, forming a natural, tender "father-son" relationship. Gooding rarely overplays Radio's disability, concentrating instead on the numerous subtleties and ticks that comprise his unique, child-like personality, and the result is one of his best performances. But it's still very much a "performance," and it's hard to divorce Gooding's often vivacious bravado from this change-of-pace role. Consequently, his intense emotional moments don't always provoke the desired tearful reaction. Harris, however, never strikes a false note. His love for and devotion to Radio are obvious, but he really excels in conveying the frustrations of dealing with such a severely handicapped person, the never-ending commitment it requires, and the pressures and sacrifices�both professional and domestic�one must endure to see it through. Although Gooding plays the title character and enjoys a far showier role, don't be fooled. Harris is the heart, soul, and conscience of Radio, and his warm, passionate portrayal greatly enhances the film. Image Transfer Review: Aided by a high definition master, Radio looks terrific on DVD. The soft, lush colors often produce striking contrast levels, but the heightened clarity doesn't sacrifice any film-like warmth or depth. Accurate fleshtones, excellent shadow detail, and a minimal amount of digital enhancement help this fine transfer score a touchdown. Audio Transfer Review: The DD 5.1 track provides lively, enveloping sound, especially during the football sequences. The bass frequencies really kick in during tackles and blocks, while the memory-lane 1970s soundtrack and James Horner's majestic score enjoy wonderful presence and fidelity. Subtle ambient effects play across the rear speakers, and front channel directionality is often distinct. Dialogue can be slightly muffled at times, but this is a first-class audio effort overall. Extras Review: Radio comes padded with several worthwhile extras, the first of which is Mike Tollin's director's commentary. Tollin makes several cogent points regarding his intentions for the film, and expresses disappointment over Columbia's sports-oriented marketing focus. Preserving the real Radio's dignity, pride, and self-worth was always foremost in his mind, and he consciously sought to make the film a triumph of the heart and spirit, rather than a chronicle of a team mascot. Tollin talks about his seven-year journey to bring Radio's story to the screen, and how he hopes his extensive research brought the film an appropriate degree of authenticity. He notes Harris' "incredible commitment" to the project and discusses his intimate collaborations with the actor. He lavishes equal praise on Gooding and Winger, and possesses obvious admiration for each. Sadly, Tollin often delivers his commentary in a monotonic drone, which makes extended listening a chore, but fans of the film will enjoy plenty of interesting nuggets. Three informative featurettes kick off with the 21-minute Tuning in on Radio, a traditional making-of documentary, which contains the usual cast and crew interviews, as well as behind-the-scenes footage. Screenwriter Mike Rich discusses the challenge of condensing a multi-decade story into a calendar year, while Tollin praises Gooding's "extraordinary instincts." The director also marvels at how Winger "shook things up" on the set, and the actress herself admits working with Tollin forced her to rethink her retirement. Footage of the real Radio and Coach Jones visiting the set and schmoozing with the actors adds a realistic touch to this engaging, if slightly bloated, piece. Writing Radio focuses on the scripting process and features additional interviews with Gary Smith, author of the Sports Illustrated article that inspired the movie, and Coach Jones. The 12-minute featurette often superimposes written excerpts from the screenplay over film clips, and the clever device nicely emphasizes the symbiotic relationship between the image and the page. Clocking in at 10 minutes, The 12-Hour Football Games of Radio examines the film's sports segments through interview clips, practice scrimmages, and on-set footage. Fifteen hundred applicants apparently answered the open casting call for football players, and vied for a mere 65 spots. Tollin addresses the challenge of working with accomplished athletes who know nothing of the filmmaking process, and the advantages and pitfalls of a multi-camera shoot, while actor Riley Smith recalls the incessant, exhausting drills executed by sports coordinator and "boot camp sergeant" Mark Ellis. Six deleted scenes (totaling six-and-a-half minutes) are both interesting and amusing, although nothing of note seems to have been cut. An optional director's commentary explains the reasons for the excisions. Selected cast and crew filmographies and a slew of trailers are also included on the disc. Finally, a highly worthwhile DVD-ROM supplement entitled Someone to Lean On offers an adapted version of Gary Smith's original 1996 Sports Illustrated article that first introduced the world to Radio, Coach Jones, and the people of Anderson, South Carolina. The absorbing, beautifully written piece can be read with or without the syrupy (and maddeningly repetitive) mood music. Radio hits all the marks, but, like most mainstream films, never challenges or surprises the audience. Still, it's a cut above the typical feel-good family movie, and should entertain and touch most viewers, especially the younger set. Blatant sentimentality and a lofty moral tone threaten to sabotage the production, but the always marvelous Ed Harris keeps the film honest, and prevents it from degenerating into a mawkish mess. Admirers of Radio will appreciate the terrific transfer and solid extras, but for the rest of us a rental will suffice.